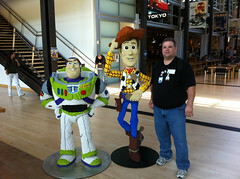 This past week I was out at Apple’s World Wide Developer Conference in San Francisco. 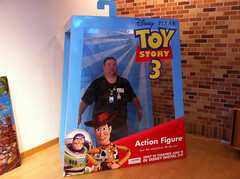 Due to some fantastic circumstances, I was able to go on a tour of Pixar Animation Studios. It’s not open to the public, I was lucky enough to be invited by an employee I know for a tour. 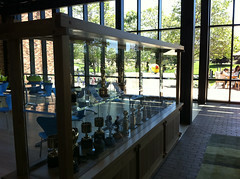 All I can show you here are some photos I was able to take of the reception lobby. Everywhere else in the building is covered under a non-disclosure agreement, so no photography. 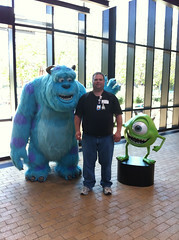 Pixar Lobby Me with Sulley and Mike from Monsters Inc. The lobby is truly awesome. 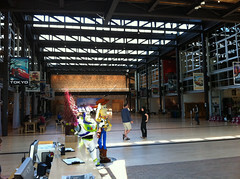 On the left is the cafeteria, on the right are the company store, the mailroom, the playroom and a kitchen. 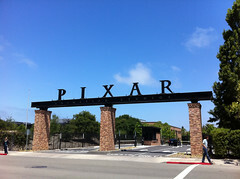 The building was designed by Steve Jobs and is setup to make “chance encounters” happen between people from different departments. It’s an incredible working environment. I wish I could show you what I saw once we went upstairs, but I’d hate to get myself and my employee friend in trouble. 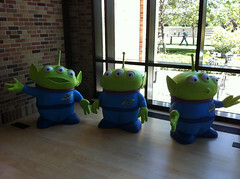 If you ever get the chance to tour the Pixar Studio, do it! This entry was posted in Movies, Travel. Bookmark the permalink. That’s so Amazing! The lobbly reminds me of the work lobby from Monsters Inc for some reason. 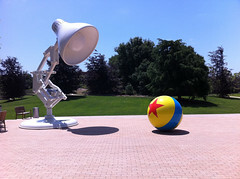 I’d really love to visit Pixar. I’m going to San Francisco on a short 1 week trip on Tuesday, maybe I’ll have to wrangle myself a friend that works there to show me around 😀 Hook a brother up? haha. Did you see anything else in San Fran other than the usual Tourist trap type things that you’d recommend? -your new Australian reader, George.